The kirk was decked at morning tide. JESSIE, THE FLOWER O' DUMBLANE. Robert Tannahill was the author of this beautiful song. 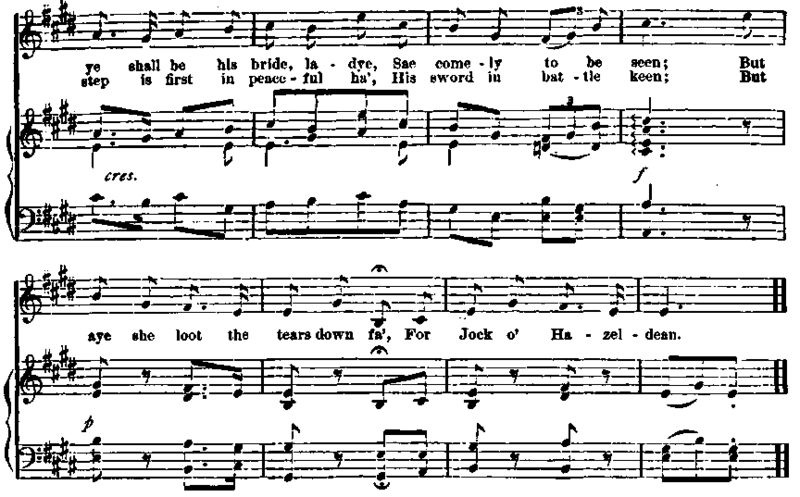 The last stanza, beginning " How lost were my days till I met with my Jessie," was not in the original song, and it is so commonplace that it is difficult to believe Tannahill added it. The heroine of the song has been much speculated about. Each Jessie, in the old town, had the honor of being represented as the "blooming fair." Dumblane lay upon a celebrated and picturesque stage-route, and we can fancy the quieter rolling of the rumbling wheels, and the louder rolling of the driver's voice, who, with his long whip, used to point out to each fresh load of sight-seeking and story-loving passengers, the humble cottage where the tiny bud, that became the far-famed " flower o' Dumblane," unfolded to the light. One enthusiastic traveller published an account of his interview with the bonnie lassie, then a decidedly plain old lady. Alas! for the truthfulness of this historian. Jessie was but a poet's dream. Tannahill never was in Dumblane; had he been, he would have known that from there the sun could not be seen going down " o'er the lofty Ben Lomond." The only fancies of the poet's short life were for two young women of his native town of Paisley. The exquisite air was made by Robert Archibald Smith, who is celebrated as a composer, and student of Scottish airs, of which he made some of the sweetest. He set some of Tannahill's best songs. He was bora at Reading, Berkshire, England, November 16, 1780, and died in Ediuburgh, January 3, 1829.